Selling a pony car in 1975 was like throwing a wild party in a retirement community. There were just too many opposing factors trying to stop anything exciting happening. The world was still reeling from the OPEC Oil Crisis the year before. In America, insurance prices had soared and emissions standards were getting stricter. Chrysler and AMC exited the pony car market and Ford had basically done the same by downsizing its Mustang. Only GM remained, and even they were contemplating killing off the F-Body Pontiac Firebird and Chevrolet Camaro and focussing on the smaller H-Body Chevrolet Monza and its clones. But then a funny thing happened: sales picked up. GM was the only game in town if you wanted a real pony car, and they enjoyed the spoils. The 1970-73 Firebirds had graceful, almost European lines. The 1977-81 “Bandit” Firebirds were aggressive-looking. These 1974-76 ‘birds represent a rather dull interregnum. While not unattractive, and boasting 5-MPH bumpers much better integrated than on other cars, they look a little plain. Under the hood – which could be covered with a screaming chicken, of course, on the Trans Am – there was still plenty of power. Big blocks were supposed to be going extinct, but Pontiac hadn’t gotten the memo yet. The wild 290 hp Super-Duty 455, launched in 1973, was offered in ’74 Firebirds. There were also less powerful 350, 400 and 455 cubic-inch V8s. 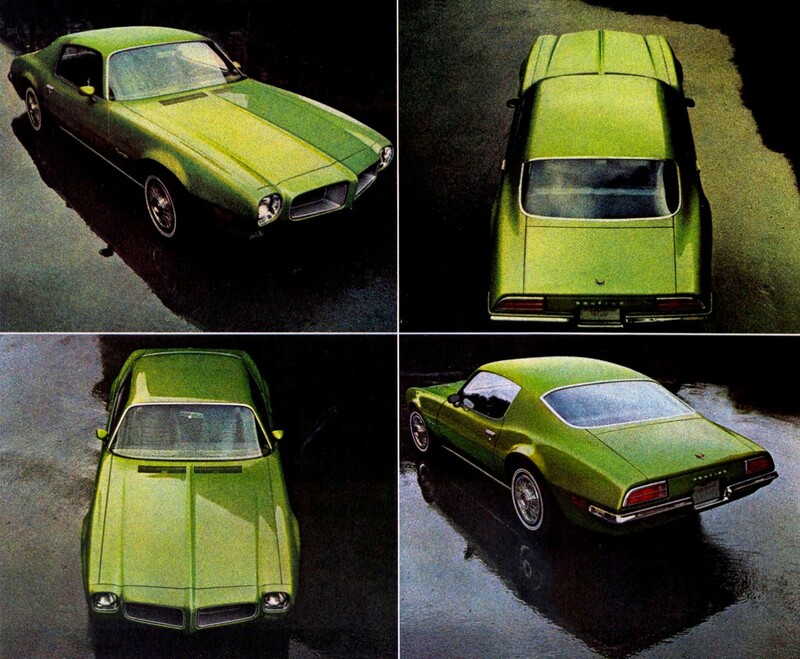 Pontiac sales may have been trending downwards, but the Firebird was unaffected. 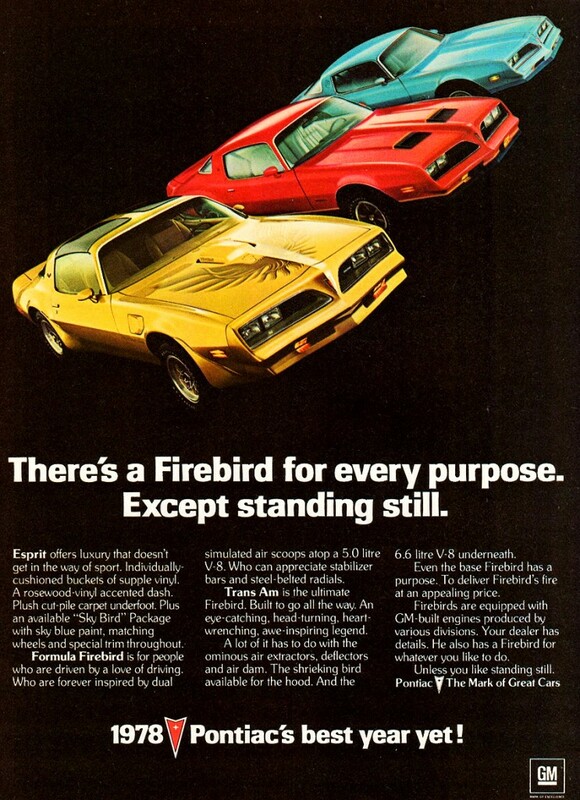 For 1974, sales rose to 73,329 and Trans Ams were accounting for a growing portion of Firebird sales. But for 1975, performance took a turn for the worse. Catalytic converters were now fitted, and all engines took a hit: the 455 lost 50 horsepower, the 400 lost 40 horses, and the Super-Duty lost its life. The 455 was actually axed for 1975, but Pontiac succumbed to pressure and reintroduced it mid-year. Firebirds gained a handsome wraparound rear window, something that was intended for launch much earlier but hadn’t eventuated due to build concerns. And in spite of events the year prior and the decrease in power, Firebird sales rose once again and almost a third were Trans Ams. 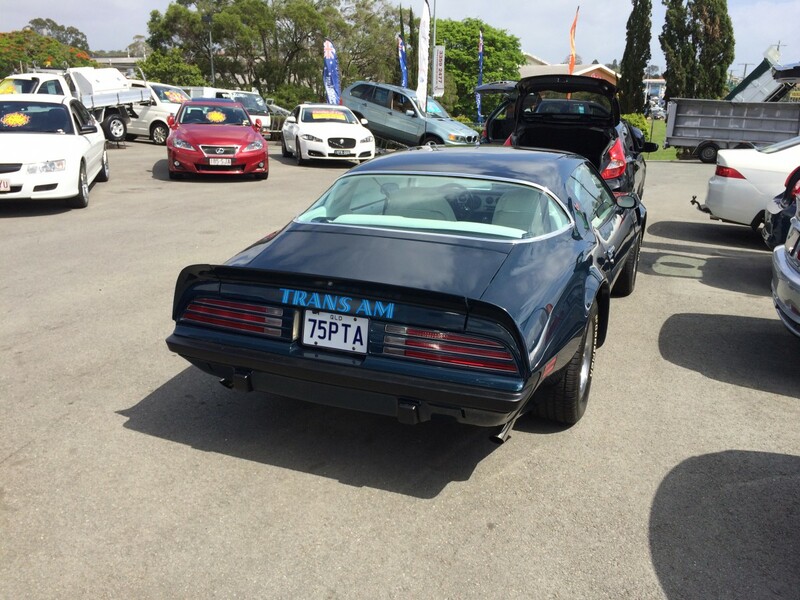 This ’75 Trans Am I spotted on a dealer lot (alongside a ’73 Plymouth Roadrunner, a ’72 Dodge Challenger and a ’68 Plymouth Satellite) looked like it had been slightly modified from stock. I did appreciate this period touch, though. 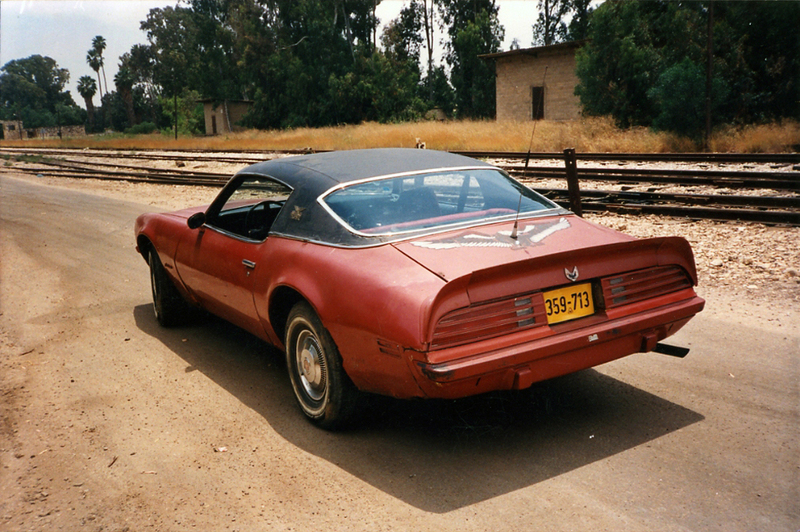 The final year of these plainer Firebirds, 1976, saw the launch of T-tops on the “Special Edition” Trans Am. These were the most beautiful of the ’74-76 models as they were painted black and gold. Of course, parked next to a ’77 in the same color scheme they just don’t look as impressive. Sales had been trending upwards but the visual revisions of 1977 must have really made a difference. By 1978, sales had more than doubled from 1974 results. The old bird had caught a fresh wind, and was likely very profitable for GM. This was surely one of the few examples of a car becoming more popular in its senior years and after multiple facelifts. Not bad for a car that was almost axed! One of the things I greatly dislike about the 75s was the grille located driving lights and the body-colored louvered fillers used in place of where the markers originally went in the 74s, those combined with the black bumper strips/overriders it made for a very busy front end. The 74, while not great, was tidier and more purposeful, and 76 was perfectly integrated, if not a little bland. 75s just had so many transitional elements like the wraparound window they look like they’re going through an awkward puberty. The 77s were great because Pontiac stopped trying to make what was essentially a compromised 70-73 front end work, and came up with one of those rare facelifts that might actually compete be as attractive as the original. I had to go back and look at the photos, as I hadn’t realised how many changes there were between the three years. Now that you’ve pointed them out to me, I have to agree. I concur as well. Both the ’74 and the ’75 look like what happens when a kid gets one of those models kits that allow you to build different model variations and decides to add them all at once, whether they all fit or not. I have never been a fan of the 77 to 79 trans-am fronts but no matter how you look at it , the Pontiac Trans am from 1974 to 1980 are still head turners and very sort after car to own worldwide by collectors . This trams am should now be the correct body weight after replacing the sticker flex with metal. The rare thing was it only had three bad rust spots , the inner door frames and the left hand rear quarter panel above the rear Parker light . But not any more.. rust all gone ! ! When buying this car I did know what I was buying and was prepared to do the work to get it up to scratch and that is why I didn’t pay top dollar .It did mine you pass a RWC with flying colours when I bought it , that was a plus ! . Unfortunately the second respray was a bad one and only masked up what was hiding underneath .Instead of stripping off the original cracked paint , it was simply filled with primer putty , sanded back and repainted , a waste of time for a cheap shortcut ! fortunately I have 25 years experience in the automotive body trade so this trans am has finally had the right repair’s done that it deserves.
. The big thing that caught my eye with this Beautiful blue trans am when I bought it .It had all original matching numbers to body and running gear etc ,factory manual 4 speed , Original colour , factory radio that works! and most of all it had paper work of history from 1975 and the body work wasn’t a nightmare .Even with the time and money spent. I haven’t gone over its current valve and it was worth the effort to rebuild .looking forward to driving it again around brisbane . To me, these “tweener” Firebirds look best when they are un-adorned…except for maybe a vinyl roof. No spoilers, no scoops, no decals, just a non pastel paint job. In other words, a Firebird like Jim Rockford’s, but not necessarily gold on gold in color. so no skybird in baby blue for you? Hi , Aaron65 . 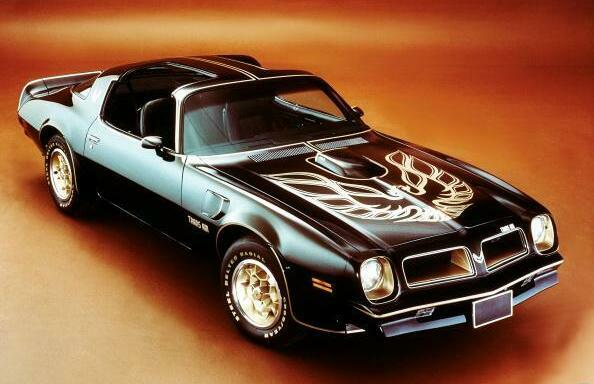 I agree the 70s trans am are the best looking Vehicle. 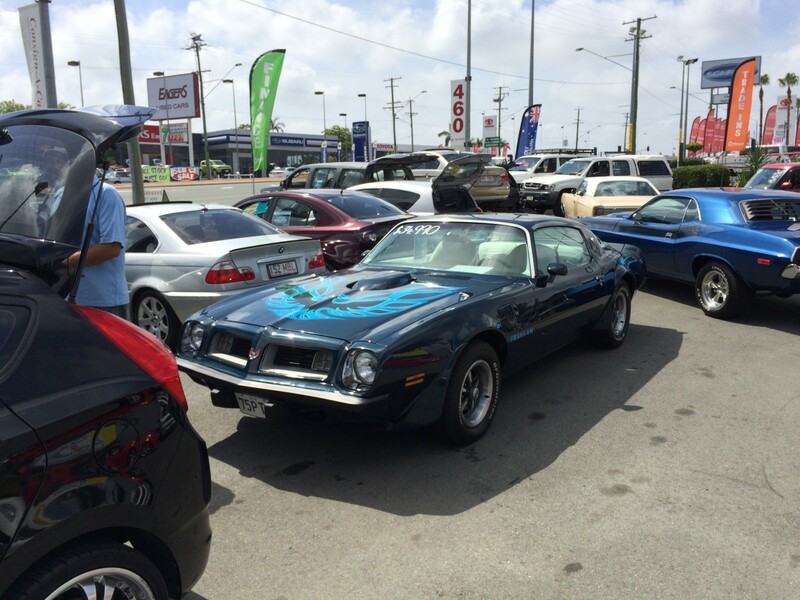 In fact the stella blue trans am shown in the car yard on the gold coast Queensland Australia is the very one I bought in December 2015 . And repainted . I must admit this Pontiac trans am is a great car to drive . Yes, all the gingerbread just serves to distract from the excellent design of the basic bodyshell. The best to me, aesthetically, is a 1970 Camaro base model. Almost agree with you. Prefer the original rendition of the Rallye Sport front end because it was both visually simpler and more impressive, followed by the same generation Firebird as long as it doesn’t have hood scoops. Third is the original base line Camaro. In 1977, looking for my first car to buy as a young driver, I went to the local Chevrolet dealer to look over a 75 Trans Am in this exact same exterior and interior color. Same color screaming chicken hood decal, as too the Trans Am side and rear decals. I so wanted that car; unfortunately, my monthly payments would not allow it; so I settled on the pony car sitting next to the T/A; a 1974 Camaro Type LT, 350, 2 barrel and Saginaw 4 speed. A nice consolation prize, if you will; but still no Trans Am, without the engine turned dash, shaker hood scoop, side air extractors, splitter rear exhaust pipes…… Pontiac knew how to do it in these days, and in doing so, kept the flame alive. Heck, had the T/A not kept the pony car fires going, I think it’s safe to say it all would have died on the vine in 1974, with the departure of the Cuda, Challenger and Javelin on the scene. Now, Pontiac is dead but the Camaro, Mustang and Challenger are alive. What a turn of events, something no fan of the Trans Am could ever have envisioned in the decade of the 70’s…. 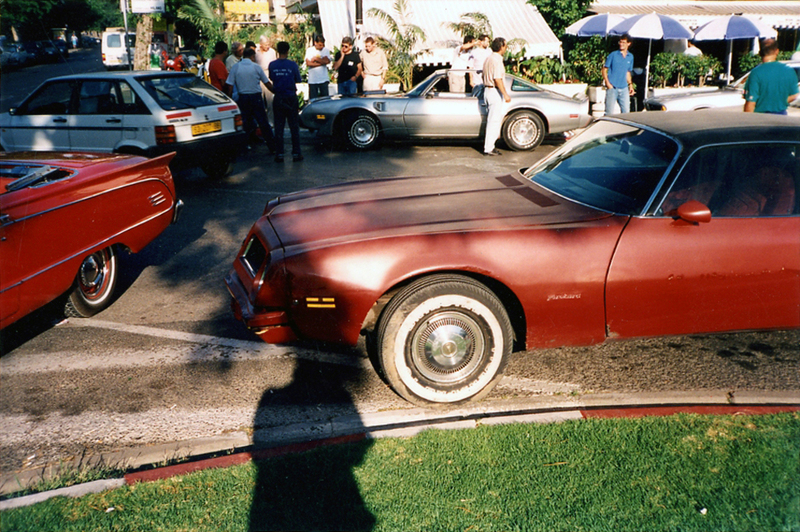 There was a “prototype” of a Firebird companion to the Camaro back a few years when GM was still trying to decide if they needed the Pontiac brand….or the Camaro, for that matter. I dunno, these birds look pretty good to me. 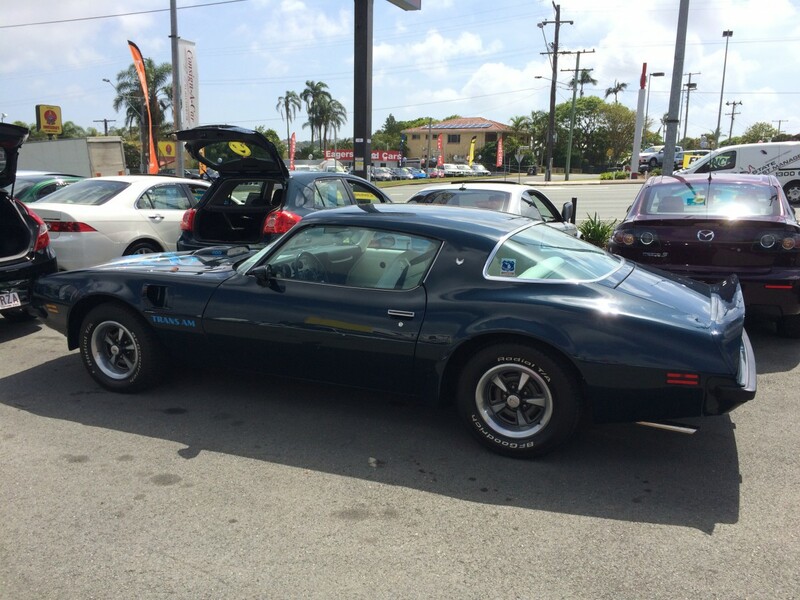 But idont think ANY Firebird or T/A looked ‘bad’….just different levels of good, depending on the year and how it was outfitted. That said, PLEASE show the Chally and RR!!!! That Challenger looks like how I would rock an E-body: nice shade of blue, black trim, wide coke bottles in an appropriate size, and just the right stance. That car looks perfectly period correct. That Challenger is a lovely 72-74 model tarted up to look like a 70 R/T. It really annoyed me to see. I’ll do a capsule/outtake on it soon! This market unpredictability that rose up after the 1973 oil price spike came to haunt GM in the 1980s. Beginning with the introduction of the 1982 FWD A body, GM became fearful about cancelling just about any car that was still selling in decent numbers. The result was chaos in the showrooms were big luxurious RWD V-8 powered Chevys sold for a good deal less than fairly small FWD V-6 powered Oldsmobiles and Buicks. Every oil price spike since has made odd winners of older and sometimes not even very competitive cars. Probably the best example of all; the 1979 oil price spike nearly killed Ford’s newly introduce Panther cars which were a little rough as introduced. They eventually became a bit more refined and became the best or among the best selling cars in each of Ford’s three primary brands for a good chunk of the mid and later 1980’s. While like most I still prefer the earlier and later front ends on the second-generation Firebird, I am warming to this one. It is still a pretty clean design. Much neater than Camaros of that period. Yes, definitely. The Camaro looked like it had been stung by bees in comparison. These are handsome cars. In a sort of Pre-CC effect, I saw one of these Saturday in Portland traffic heading south on I-205. It was in resale red and didn’t have the decals. It was great that these 2G F-Bodies were not killed and continued on until they were downsized in 1982. The RWD H-Bodies were not that sporty enough especially since these were variations of the Chevy Vega and as such replaced both the Vega and Astre line instead after 1977. 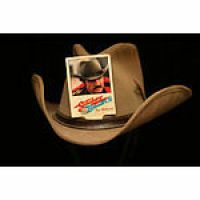 Smokey and the Bandit coming out in 1977 probably helped Firebird sales as well. 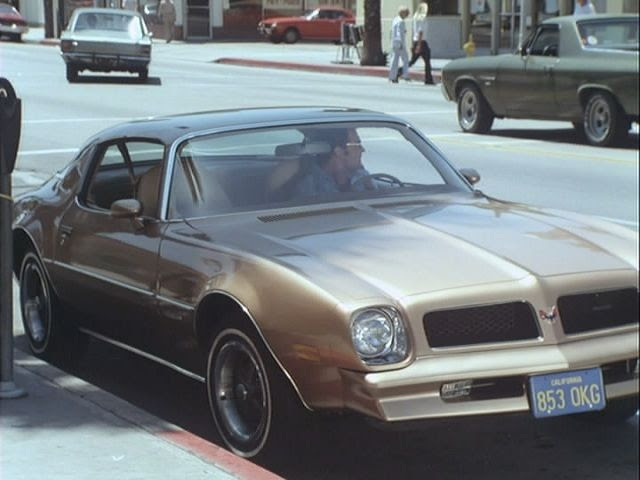 How about The Rockford Files since Jim Rockford owned various renditions of the 2G Firebirds? The 1973, 1974, 1975 and 1977. Pedro, his first was a ’74, and then he had each model year through ’78, keeping the ’78 until the end of the series. That is true…it’s sad, but they’d trash a ’70-’73 in place of the star car, but today, those versions are the ones everyone wants! Rockford had a car chase or two in just about every episode. They really didn’t care too much about scene continuity or if it was noticeable that the car that was about to get demolished would suddenly age 10 model years before it got smashed. This was always one of my favorite chases involving a 1974 or ’75 Imperial coupe. The fender skirts sort of come and go during the course of the chase, probably due to some casual editing. It was always fun to watch the decent handling Firebird go up against wildly all over the road luxobarges like this. Dave B – the car chase is pretty awesome. I forgot how simple (and lame) TV was back in the day. It also reminded me what sloppy pigs cars were back then to handle….. The Rockford Files has always been my favorite TV show. They kept the ’78 Firebird through the end of the series because James Garner did not like the restyled front end on the ’79 model. I have also read that the cars they used in the series were actually Formula Firebirds dressed up to look like Espirits due to the heavier suspension etc. He also used the 1976 Firebird Esprit in Gold. And the 1978 Model. Models from ’73 to ’78. The Tv Series ran from ’74 to ’80. I was going to say the same thing. That movie was huge at the time. It was the second-highest grossing movie of 1977, after Star Wars. That movie gave Firebird sales a huge boost. If I recall correctly, by 1978, the Trans Am was the most popular version of the Firebird, even though it was the most expensive. 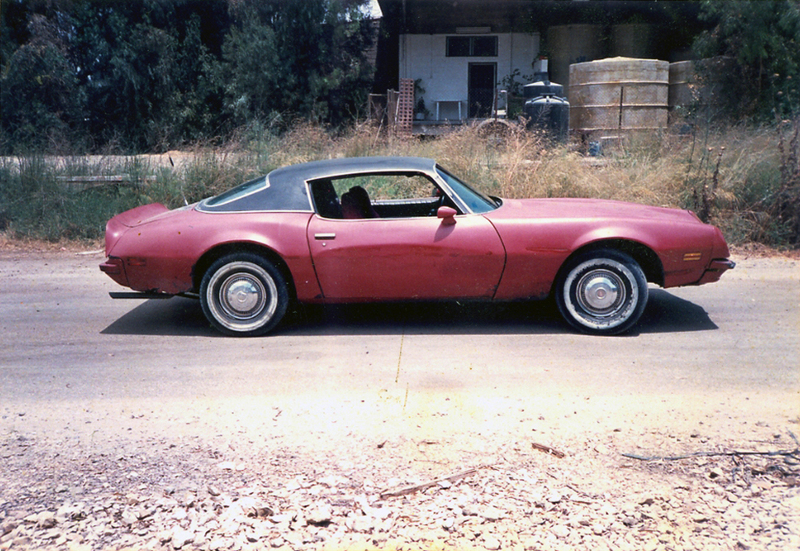 Usually the top-of-the-line performance versions were easily outsold by their tamer and less expensive siblings, but that was not the case with the Firebird in the late 1970s. 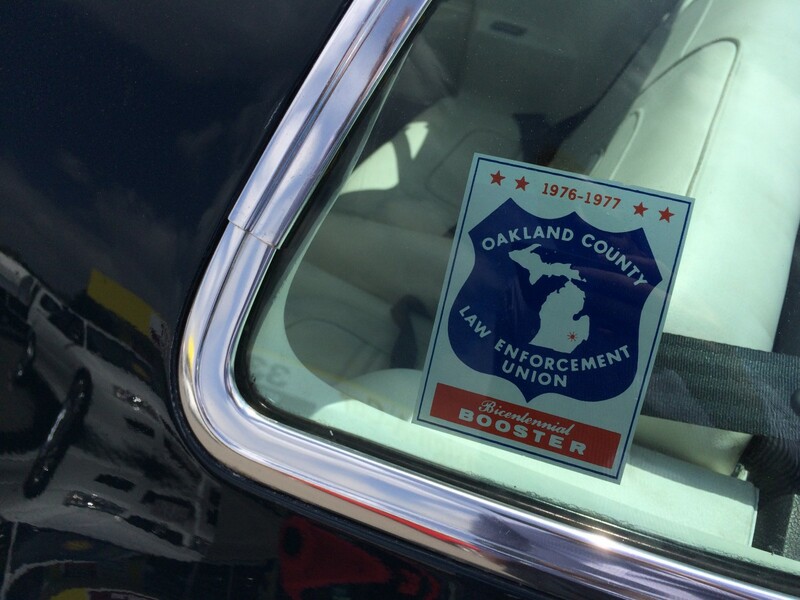 This was even true of the other car that was slapped together in Norwood and Van Nuys during the “Bandit” era. There were infinitely more base model and LT Camaros on the road than the newly revived (thanks to strong T/A sales) Z28. It wasn’t until toward the end of the 2nd gen F-bodies (circa 1980-81) that I remember seeing Z28s in any great numbers. I never realized 1975 was the first year for the wraparound rear window! You learn something new every day. My brother owned a rare 4-speed 1974 SD-455 Trans Am – it was Buccaneer Red with a black vinyl top and black custom buckets. That car was insanely fast, so much so that he almost killed himself in it and my father insisted that he sell it. I know today it would be worth well over $100k due to the rarity of the 4-speed and SD-455 engine. Now that my brother is 60 years old, he could kick himself for acting like a fool when he had that car! Yohai, you’re being too hard on yourself and your car… That thing is cool AND it runs. Not many project cars DO. How cool is that? Don’t get me wrong, I’m not sorry for the experience; I love the 2nd gen Firebirds. But this particular example was really in a bad shape, plus it was only a straight six, which was a downer… Also didn’t help that it came at the wrong time- I was in the IDF back then, with absolutely no time or money to run it (never mind restoring it). Love it! But then I’m a fan of Firebird Esprits and Camaro Type LTs and Berlinettas. I would LOVE a ’77 Firebird Skybird. You must’ve loved watching Headbanger’s Ball on MTV, back from 1986-91, eh? Good memories of good times. My brother had sold his 73 Camaro type LT which he bought new, for a 76 Trans Am red with gold trim. He let me borrow it to take a date to see Smokey and the Bandit. Wow, that parking lot was full of Trans Ams! His 76 was a pretty good runner. All 400 cubes of torque combined with that smooth turbo hydro would run up to 100 mph.like it was the double nickle. These cars were great fun and there was a certain mystique to them. They were just “special” and made you feel like a hero when you drove or even rode in one. This feeling returned in the late 80’s with the Mustang GT five- point- oh. Even better, look around at the Pony cars that are available today. This is your time to grab a little glory! I owned a last-year 2nd gen, but I prefer this front end, though the ’70-73 is of course the best. By the way, mine was a TransAm, bought new, and the screaming chicken decal was actually an option. My car didn’t have it. Nor did it have the chrome tailpipe tips. The wrap around window looks awkward but did slightly help rearward visibility. I only kept the car less than a year, and unfortunately fuel prices skyrocketing plus the intro of the 3rd gen killed the resale value. Not my favorite Trans Am, but I still like it quite a bit. ESPECIALLY the “screaming chicken”. You know, I’d really be interested in a piece on the Pontiac Super Duty engines. Specifically, I wonder how they kept rolling with them after emissions regs killed off the other hi-po motors? That’s right! Second time this week The Driver popped up in the comments, love that chase, even if the Trans Am had goofy decals. I’ve never been much of a pickup truck enthusiast but that C10 certainly came close to converting me when I first saw that movie. Wow, there is more cheese in that commercial than Baywatch and Knight Rider put together! Thanks for posting it. Haha, I thought I was watching a Knight Rider episode for a second! 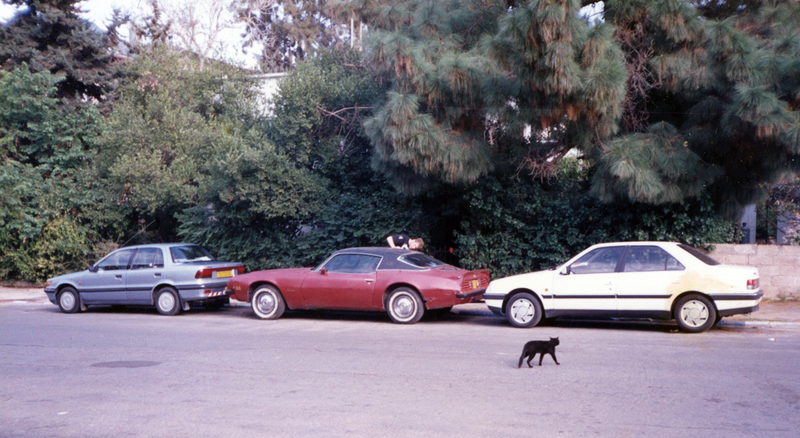 The car in this picture,1975 Blue Trans Am ,with white interior,tag # 75PTA.Is this car available for sale ?